Why is an article about Die Gartenlaube in Maplewood History? A year or two ago my wife and I were making a stack of books in which we had lost interest and were preparing to donate them to the public library which would sell them to raise a little money. In the process I discovered a book that neither of us has any recollection of acquiring. It is a bound volume of Die Gartenlaube magazines from 1901. Since it was published in German I can’t read any of the articles in it. But thumbing through it I was captivated by the illustrations. They are stunning pieces of art. I wound up photographing most of them. That should have been the end of it and it was until I saw a few copies of William Lyman Thomas’ School and Home magazine in this treasure trove of Maplewoodiana through which I’ve been sifting. I was immediately struck by the resemblance to Die Gartenlaube magazine. 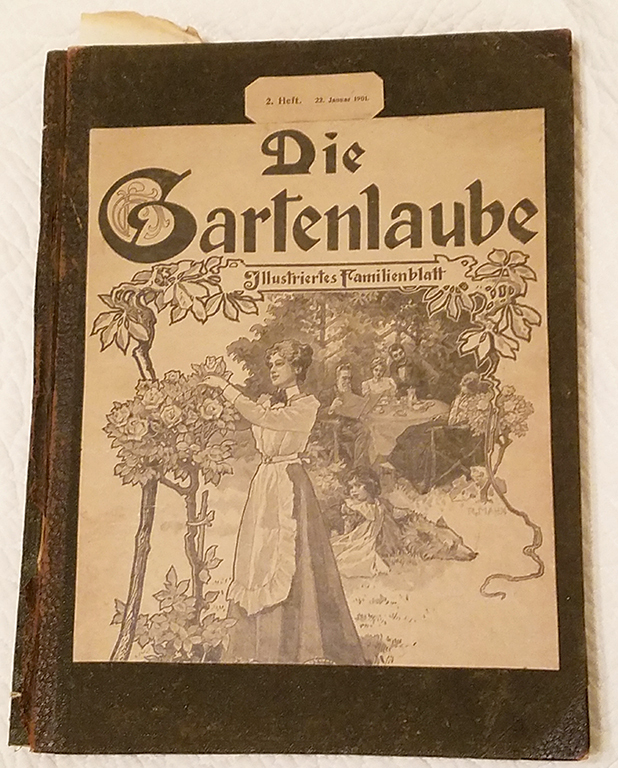 If the Wikipedia article is correct and Die Gartenlaube is “a forerunner of all modern magazines” I suspect that Thomas and no doubt many others may have modeled their publications after the German one. Thomas certainly may have been familiar with Die Gartenlaube. 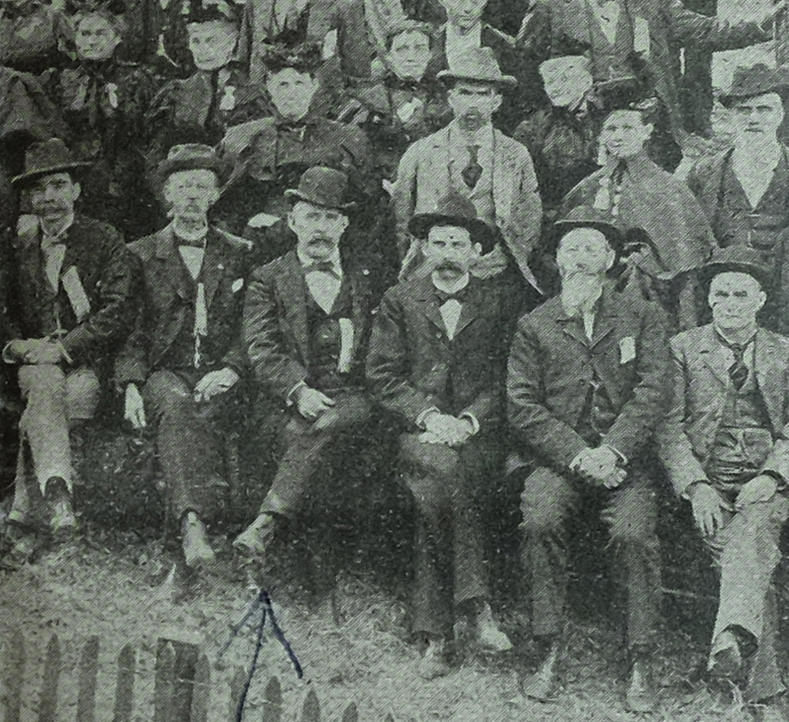 There was a large population of German immigrants in St. Louis. They had German language newspapers, schools and churches. 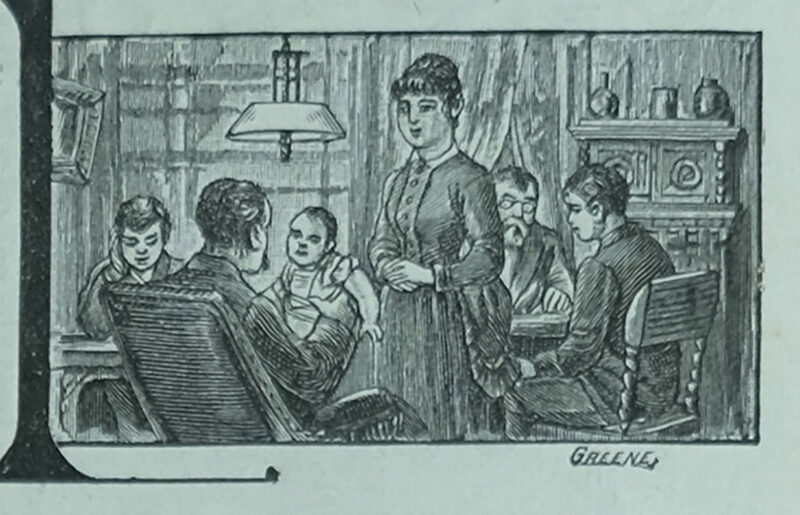 Thomas published School and Home from about 1883 until 1899. I don’t know what happened next. I don’t know if he simply ceased publishing his magazine or if he sold it. 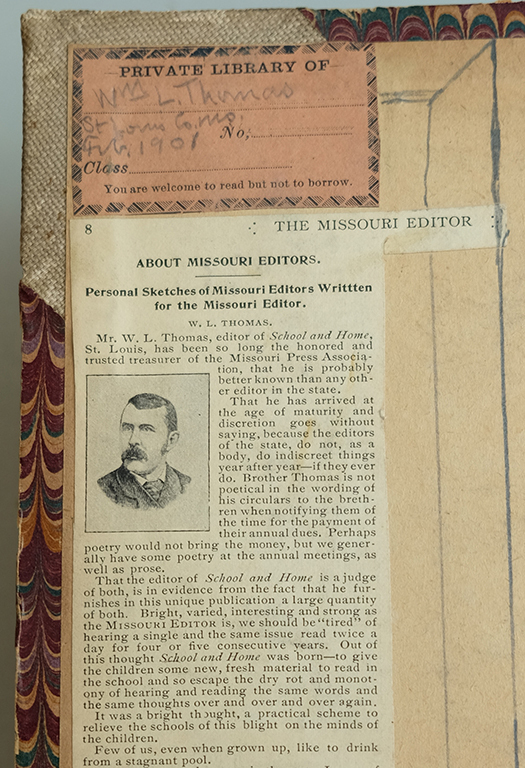 I learned nothing from searching the archive of the St Louis Post-Dispatch newspaper. This post contains images from the School and Home magazine, Next post I’ll include some of the images from this bound volume of Die Gartenlaube that has somehow come into my possession. See a follow-up post here. 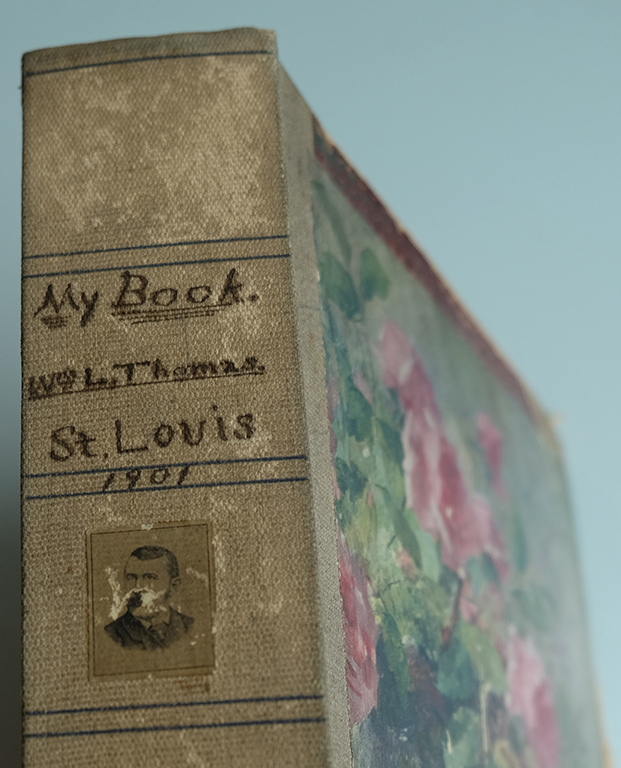 A 1901 scrapbook of William Lyman Thomas’. Courtesy of the Thomas family descendants. 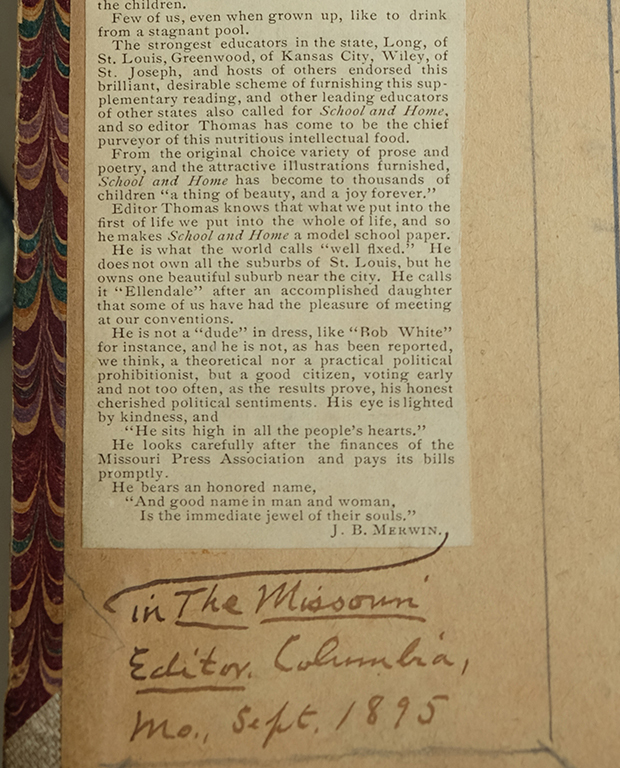 The top half of an article Thomas pasted on the inside of the cover of his scrapbook. Here is the rest of it. 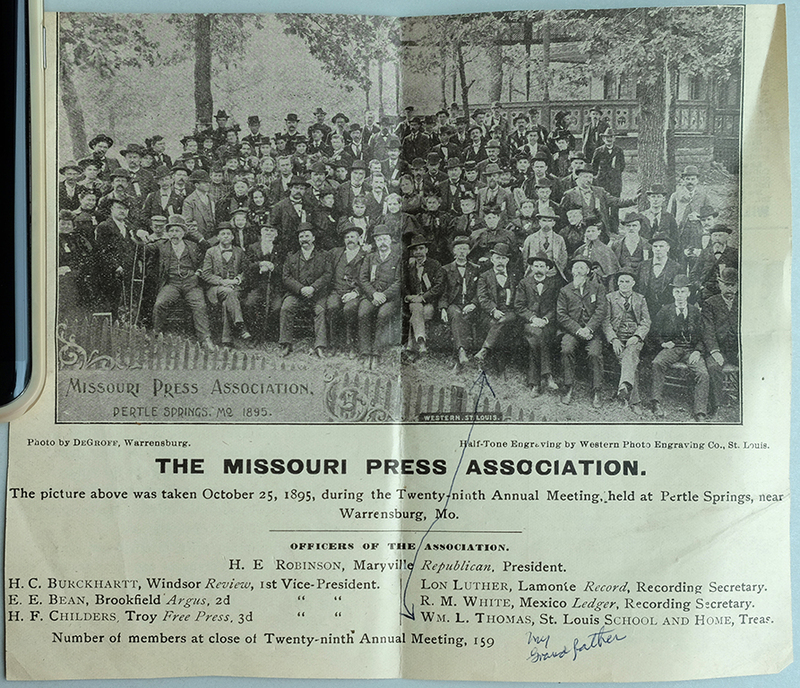 Thomas at an 1895 Missouri Press Association meeting. 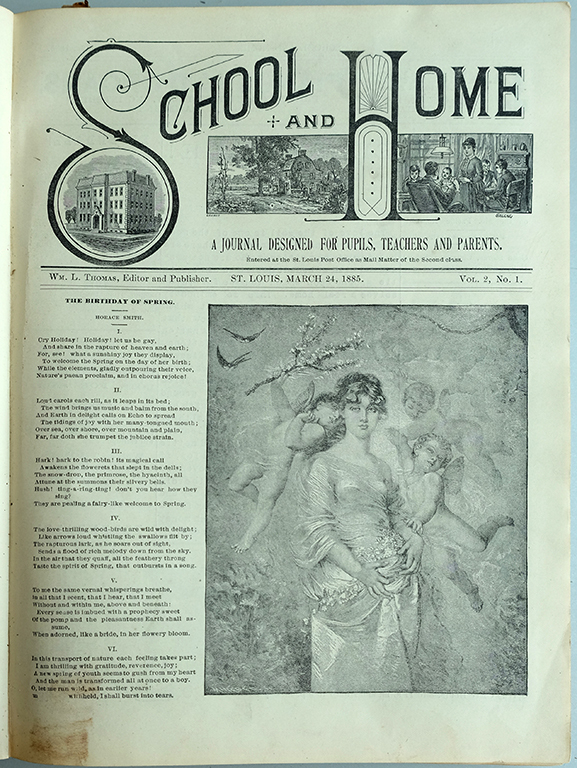 March 24, 1885 issue of School and Home magazine. The artist of this detail from the masthead has used only his last name, Greene. I suspect this is the A.B.Greene who was mentioned a few posts back. More on him later. 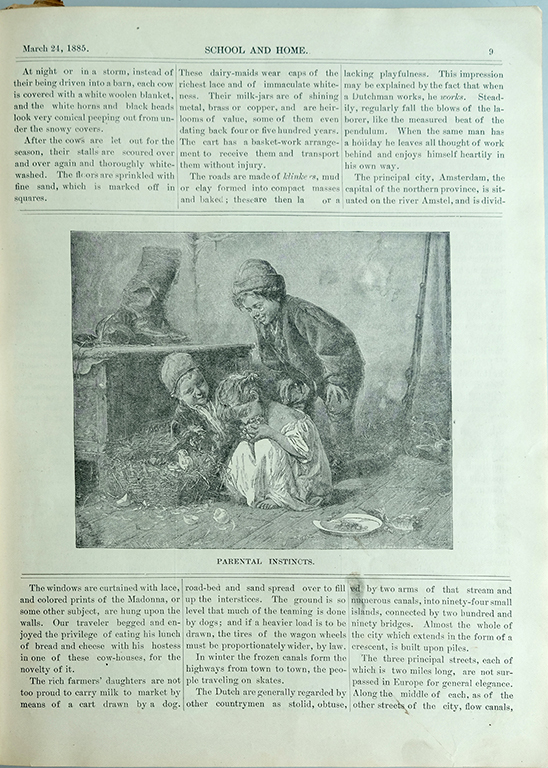 A fairly typical page from the March 24, 1885 issue. A closeup of the illustration. 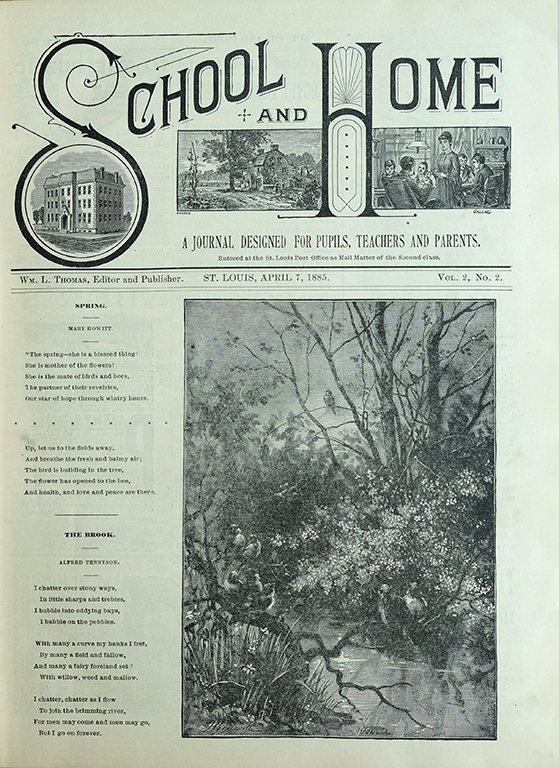 April 7, 1885 issue of School and Home magazine. 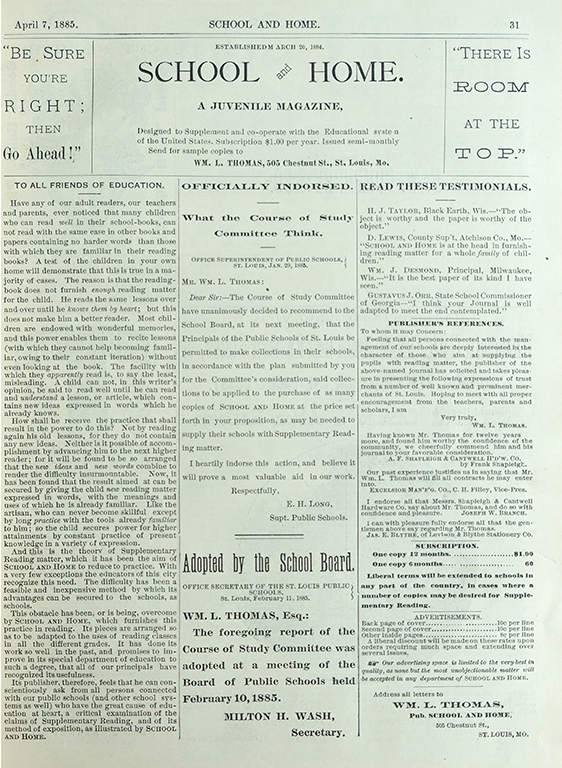 Thomas’ manifesto from the same issue. 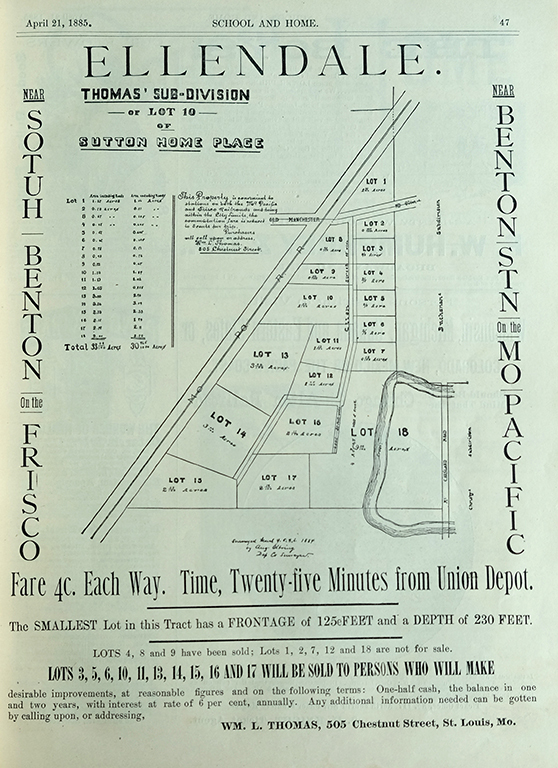 From the April 21, 1885 issue, an advertisement for Thomas’ own Ellendale subdivision. This is my hardbound volume of Die Gartenlaube publications from 1901. Next post I’ll include some of the images contained within. As always much thanks to the descendants of William Lyman and Kate Compton Thomas for allowing us access to their very interesting family archive. They sure are, aren’t they, Phyllis? Thanks for your comment. Good to hear from you. I knew a woman who grew up outside of Herman. When I first met her back in the 70’s I asked her son which part of Germany she was from, because of her German accent. Margaret, I wonder what generation German that woman was for her to retain the accent. Second, maybe? Thanks for your interesting comment. Doug, I am not sure. She would be in her 90’s now if she was still alive. I will have to ask her son. Most likely second, since she was raised in Herman. This came by email from Dawn Yourtee, our Program Director at the Maplewood Public Library. Hey Dawn, That is fascinating. It was a very different world. For those unfamiliar with them, our library has a wealth of great programs they present each year. We all would do well to try and make as many as possible. Thank you, Dawn, for providing this information. My neighbor attended public school in which never a word of English was spoken, only German. That is very interesting, Gary. That is a detail that I am completely unfamiliar with. I wonder what years those were. Thanks for mentioning that. I worked on a home years ago and we had to remove part of an outside wall. Inside the wall between the studs we found several copies of German newspapers. I do not recall the dates but do remember the homeowners that I worked with kept them. I was surprised to find them not really knowing that St Louis had so much German heritage that they had their own newspapers. Hi Mark, An interesting story that I don’t know much about would be the local suppression of nearly all things German in the years leading up to and during the first World War. For instance I know the names of a couple of the streets which had distinctly German names were changed. And I remember hearing that the German language ceased to be taught in schools. I don’t know when it was resumed. Thanks for your comment. I don’t think it did resume in some areas. My paternal grandmother said her family quit speaking German during World War I. That was north of Waterloo, Iowa. 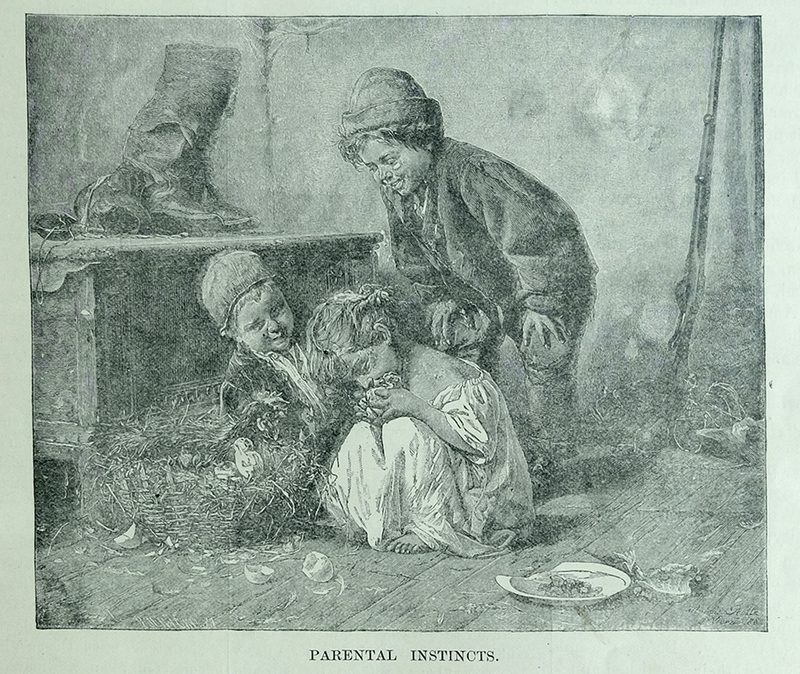 By then, the immigrant generation (arrived 1840s and 1850s) was deceased or soon to be deceased. world war or not I think it is pretty common for the first generation of folks coming to the US to keep their native tongue. The second keeps it some and often by the 3rd it is pretty well gone. Or so it seems to me at least here in the midwest. Maybe someplace like Chicago or San Fransisco or New York where you can have your own little town of like minded folks who speak and read the language they might keep it alive. Think Maplewood that has it’s own doctors, lawyers, churches, stores and schools and plenty of other things to promote a city being a German enclave and the language might have been kept up.